Directly on the Beach * Beautiful View !!! Come and enjoy the beautiful white sandy beaches of Gulf Shores. You will love the view from the balcony of this tastefully decorated and comfortable condominium. The spacious great room invites casual dining and the entertainment center includes DVD and Cable TV. Free Wi-Fi is also available. Seacrest Condominium offers Gulf side pool and hot tub, boardwalk to the Gulf beaches with an outdoor shower area, shaded gazebo, Gulf side grills, pool-side restrooms, two elevators, luggage carts, spacious lobby, plenty of parking, beach chairs, seasonal umbrella rentals on-site, free wi-fit and nightly security. This condominium features a full-size kitchen, master bedroom complete with a king-size bed, bunk beds in the hall and a queen-size sleeper sofa in the great room. Linens, iron, and all kitchen utensils are provided. My wife and I thoroughly enjoyed our 2 weeks in the unit. We enjoyed sitting on the balcony when not walking the beach. The unit being on the second floor allowed us to ignore the elevator other than when moving in and moving out. The unit was clean and things worked. It is a perfect place for two. In addition, the location of Seacrest made for short rides when going to restaurants and grocery stores. When in Gulf Shores, we will stay here again. Very well maintained, great location and Jeff and Louise were absolutely great to work with. Would come back anytime. The view is great and the condo was very clean. We booked very last minute and the owners were great and very helpful. Will definitely stay here again. Stayed at Jeff and Louise's condo at Gulf Shores for my son's 7th birthday celebration. Views and location cannot be beat for the price. The condo could use some work on the inside and appears by the renovated bathroom that may be a work in progress. Older building, but very clean and secure (security on site). Plenty of parking. Unit is located next to the elevator so it got a little bit noisy in the evening but otherwise we had an excellent stay. Kids enjoyed the bunk beds! The accommodations were nice and the view was beautiful as we enjoyed coffee on the balcony. Everything was perfect and we hope to be back again this time next year! Directly on the beach with a balcony facing the Gulf. The sand is amazingly clean and wonderful location. The complex has a nice pool and hot tub, but your next to a beach...enough said. The owners of the Condo were extremely pleasant and nice to talk with over any issue you may have. 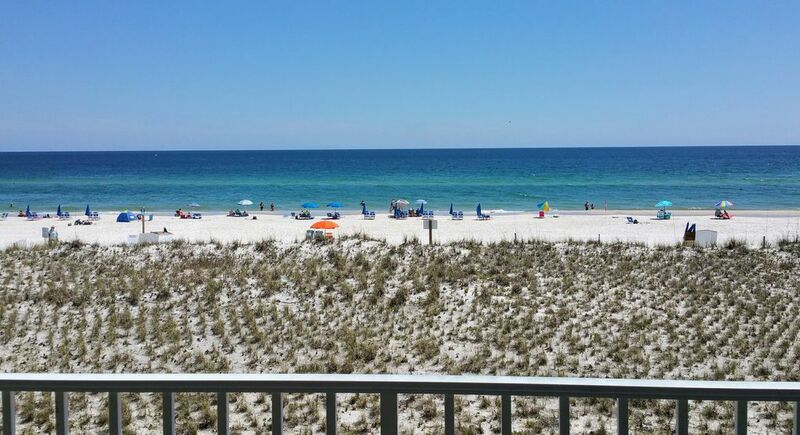 We have been to Gulf Shores, FL but Gulf Shores, AL was by far a better stay for us. All the other renters there were friendly and having a great time. We even met several families from back home. All the local residents were amazingly polite and sweet (Southern Hospitality at its greatest!!!) Our family will definitely return here to the SeaCreast and would love to stay in Unit 205 again, owned by Jeff and Louise Brannon. One bit of advice that has nothing to due with the property. Check events months out at the Wharf to save yourself some stress and money:). Everything the owners describe about the property was correct and no hidden surprises. Thank You Brannon's for a wonderful family vacation!!! Weekly Rates (Saturday-Saturday) * May 26 - July 27 Minimum Age: 25 years A signed rental agreement and copy of photo I.D. (Driver's License) is required to complete the registration.